Fluoxetine is comprised of an SSRI (selective serotonin reuptake inhibitor). SSRIs block reuptake, or reabsorption of the neurotransmitter serotonin in the brain. Changing this balance helps brain cells send and receive chemical messages. This often results in improved mood. It is only available with a prescription from your veterinarian. 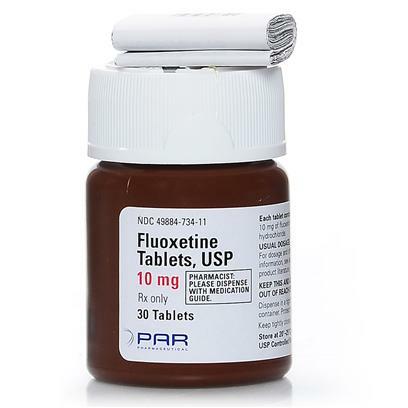 Fluxoetine is the Generic Alternative to Prozac. Stop giving fluoxetine to your dog or cat if signs of an allergic reaction occur such as: skin rash, hives, difficulty breathing; throat, face lips, ton or throat swelling. Seek emergency care if allergy symptoms are severe. Contact your veterinarian if symptoms worsen or behavior is negatively impacted. More serious side effects include seizures (convulsions); tremors, shivering, muscle stiffness or twitching; a red, blistering, peeling skin rash; problems with balance or coordination; or agitation, confusion, sweating, fast heartbeat. If any of these occur contact your veterinarian immediately. Less serious side effects include dizziness, drowsiness, weakness, runny nose, sore throat, nausea, diarrhea, changes in appetite, weight changes, dry mouth. If these issues become problematic contact your veterinarian. Certain pain medications and anti-inflammatories including carprofen, piroxicam, etodolac, and others could negatively interact with Fluoxetine. Inform your veterinarian before giving your cat or dog these medications because they can cause increased bruising and bleeding. Let your veterinarian know if your pet is being given digoxin, diazepam (Valium), phenytoin (Dilantin), warfarin (Coumadin), amitriptyline (Elavil), imipramine (Tofranil). Other drugs could also interact with fluoxetine. Talk to your veterinarian or pharmacist before giving any prescription or over the counter medicines including herbal supplement. Give Fluoxetine as prescribed by your veterinarian. Do not exceed prescribed dosage. This medication can take up to 4-6 weeks to take effect.